Posts are used for any type of content that is time sensitive or date driven. This can be content such as blog entries, articles, or news stories. This type of content tends to be social and engaging. Comments are a great way to interact with your clients and viewers through the posts made on your website. All posts by default allow comments to be added by viewers. A name and email address are required to avoid potential spam comments. 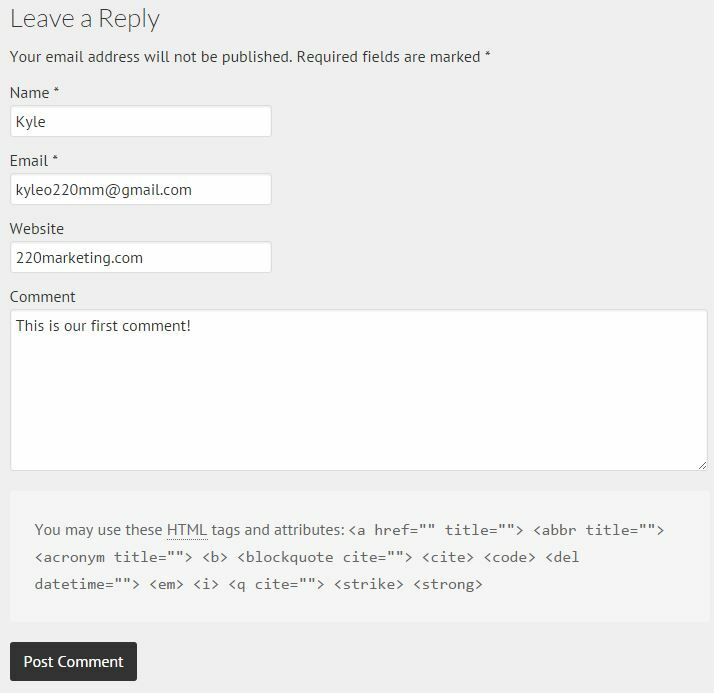 Comments are not visible on the site until you approve them through your website admin panel. At the bottom of each post there is a section that allows a viewer to make comments. Once you have approved a post for a particular poster, they can then post comments without additional approval. Below is an overview of what your viewers will see when commenting on a post. Once the Post Comment button is clicked they will see a preview of their posted comment with a message that the comment is awaiting moderation. Other viewers cannot see the comment until you have given it your approval. Now that a viewer has commented on one of our posts, we are able to manage, edit, or reply to the comment. To do so, we first need to go to the Comments section in our website admin panel. We will click the Comments tab in the main navigation menu to do so. The 1 next to Comments is indicating the number of comments that are pending approval. The Comments overview will allow us to see who made a comment and when, the comments themselves, as well as the posts that were commented on. From here we can manage individual comments or use the Bulk Actions tool to manage groups of comments. Holding your mouse over a single comment will bring up the options Approve, Reply, Quick Edit, Edit, Spam, or Trash. Clicking the Reply button below a comment will bring up an additional field to respond to that particular comment. Once you have typed your reply, you will click Approve and Reply. This will of course take care of approving the initial comment as well as posting your reply at the same time. Clicking Quick Edit allows you to edit a comment that has been made without leaving the page you are on. This can be useful if you want to quickly approve a post but perhaps want to correct a misspelling first. From here you can edit the Author's information or the comment itself. Once you make your changes, click Update Comment. Clicking Edit allows you to make more detailed changes to your post. You can still edit the Author's information, the comment itself, but you can also update the status of the post here as well. This takes you to a new screen to make your changes. Once changes are completed, click Update to the right of your screen. To approve a comment, simply click the Approve link below the comment. Once our comments have been approved, they will no longer have the red background we saw previously when we first entered our Comments section. Approved will be changed to Unapprove, allowing you to toggle between the two choices. You can also mark the post as Spam or move it to Trash to prevent it from being posted to your website. Approved comment will be visible on our website now. The message indicating that the post was awaiting moderation has been removed as well. As soon as you login to your website admin panel, you are taken to your Dashboard. You are also able to make changes to comments directly from here without needing to navigate to the Comments section. Many of the same changes can be made here, however a few are missing like the ability to Quick Edit the comment. By default commenting is allowed on all posts. You will still need to approve comments from unknown authors first. You also have the option to completely disable comments on individual pages. This can be done in a few places. The easiest is directly from the main posts screen. From here you can select Quick Edit to enable or disable comments for a particular post. You can also allow or disallow comments for multiple posts through the Bulk Edit option on the main posts page. This is an efficient way to control commenting for a large number of posts. Select the posts you want to update, choose Edit under the Bulk Edit drop down menu, and then click apply to bring up the below options. You also have the option to add the Discussion field to the New Post page. 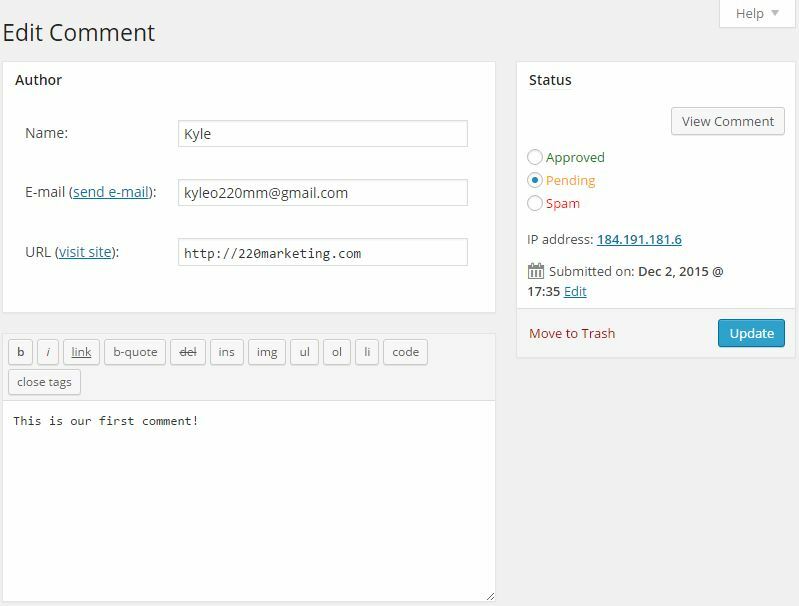 This will allow you to be able to control commenting when you initially create a post. To do so you will need to be in the New Post or Editing screen for any post. In the upper right corner of your screen, you will click the Screen Options tab. A drop down will appear with check boxes. You will need to make sure Discussion is checked. This will add a new field on the page where you create or edit posts. Commenting can be controlled through this new field. Be sure to hit Update to save your changes once they are made.